Getting and staying sober provides a special set of challenges for professional people—physicians, lawyers, corporate CEOs, accountants, and others—who drive themselves to achieve and succeed in high-pressure surroundings. Managing Your Recovery from Addiction applies business approaches and ideas to the process of planning, implementing, and carrying out programs that really work for professionals in their first year of recovery. This unique self-help book provides guidance to impaired executives and professionals seeking recovery through inpatient and outpatient care, setting strategies for managing conflict, dealing with changing emotions and moods, and developing a solid spiritual program. Managing Your Recovery from Addiction helps professionals develop both short- and long-term programs for dealing with the challenges of maintaining sobriety. The book is based on the authors’ extensive experience treating impaired business personnel in a variety of settings, including the Caron Treatment Centers and Lifeworks of London, England, an internationally recognized addictions treatment center. Their rational, scientific approach complements ongoing counseling and other treatment approaches to help keep the professional’s career on track, saving the recovering individual—and his or her employer—significant time and money due to lower productivity, arrested organizational development, absenteeism, and other problems associated with professional level addiction. Managing Your Recovery from Addiction concludes with the O’Connell Dysfunctional Attitude Survey (ODAS). 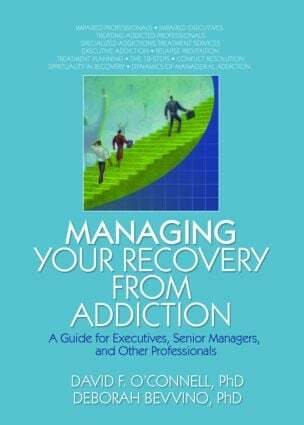 This book is vital for recovering executives and professionals and is an important resource for addictions and mental health treatment agencies that serve a professional population. It’s equally helpful for employee assistance program (EAP) personnel who regularly refer professionals for addictions treatment.